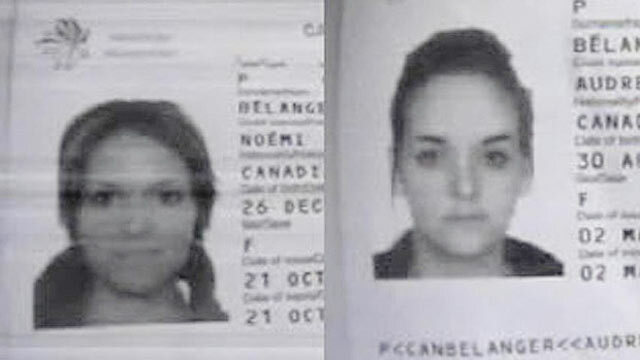 Passport photos of Noemi and Audrey Belanger, who where found dead at the Phi Phi Palm Residence Hotel, are shown. Two Canadian sisters were found dead in their hotel room on a popular tourist island in Thailand and the cause of their mysterious deaths is unknown. The womens' bodies were found in gruesome conditions, reportedly with large quantities of vomit and skin lesions, authorities said. Thai police told the Associated Press that the sisters did not appear to have been murdered and that their belongings were not taken. The sisters checked into the hotel on Tuesday and a hotel maid reportedly told Thai newspapers that she did not clean their room on Wednesday and Thursday because she believed they were inside. "The maid wanted to check if they wanted to stay at the hotel for another night, but didn't hear any response. So the hotel used a spare key to access the room," police Lt. Col. Jongrak Pimthong told the Associated Press. What she entered was a grisly scene. Authorities found a large quantity of vomit, evidence of bleeding and that the womens' nails had turned black, Dr. Pornthep Siriwanarangsan, director general of Disease Control Department, told Bangkok newspaper The Nation. Thai police referred ABCNews.com to the Canadian embassy in Bangkok, which was closed for the day. The Phi Phi Palm Residence Hotel did not respond to request for comment. "Police determined they were dead for about 24 hours prior to that and only found a lot of vomit in the room," Jongrak told the AP. "There were neither signs of fighting, nor robbery, but we found many kinds of over-the-counter drugs, including ibuprofen, which can cause serious effects on the stomach." Members of the Delanger family could not be reached for comment over the phone, but one relative, Frederick Belanger posted on Facebook that the family was "baffled" by the tragic deaths. "I know that you will always be there for me," Frederick Belanger wrote of Audrey Belanger.